Can we diagnose familial forms of ALS (fALS) earlier using MRI? 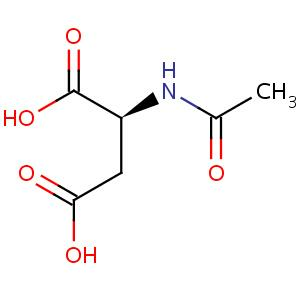 N-acetyl aspartate (NAA). The second most abundant metabolite produced by the neurons of the brain and spinal cord, NAA is routinely used by neuroimaging experts to determine the levels of neuronal loss in people with multiple sclerosis. Neurologists are currently looking towards NAA levels as a means to monitor the progression of neurodegenerative diseases including ALS. Without a single diagnostic test for ALS, physicians can spend one year on average to arrive at a diagnosis clinically. But people with ALS may not have that time to waste. With 30% of neurons lost by some estimates before patients show signs of the disease, the deterioration of the motor nerves, according to some experts, may simply be too difficult to completely reverse. To speed up the diagnosis, researchers at the University of Miami launched a study in 2006 to in part, find biomarkers that can be used to identify people at the earliest stage of disease. Called the pre-familial ALS study, the project looks for tell-tale changes in people who because of inherited mutations in ALS-associated genes are at high risk to get the disease. Now, in a study of 76 participants using magnetic resonance spectroscopy (MRS), the University of Miami team reports that the biomarker n-acetyl aspartate (NAA) in combination with other vital neuronal substances may have the potential to identify people with mutations in the superoxide dismutase gene who are likely to develop ALS. These findings also suggest that the motor nerves may start to deteriorate in people at high risk for ALS well before they show any signs of the disease. The University of Miami researchers measured the ratios of NAA to other metabolites in the cervical spinal cord of people who are at high risk for developing ALS or who have the disease and compared them to those in healthy people. The scientists found about a 40% reduction in these ratios in both groups, suggesting that considerable degeneration of the motor nerves occurred before the onset of symptoms of the disease. Now, the team is monitoring study participants annually to determine whether or not changes in the levels of these ratios of metabolites in combination with other clinical and functional measures can be used to predict which people at high risk actually develop ALS. The researchers however caution that these changes may simply be indicative of their high susceptibility of developing the disease. ALS: A MRI Investigation. 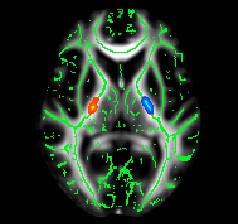 An averaged cross-sectional view of the brain from a group of people with ALS showing areas of most significant change in the descending motor nerve tracts in patients with the disease, as detected by diffusion tensor MRI. This non-invasive way of studying the central nervous system may be sensitive to very early changes when combined with other structural and functional MRI measurements. Courtesy of Martin Turner, MA, PhD, MRCP. Originally developed to detect neuronal damage in patients with multiple sclerosis, scientists in the mid 1990s turned to MRS in hopes to objectively measure the progression of ALS to develop better treatments for the disease. But researchers hit a serious roadblock. They could detect changes in metabolites that correlated with ALS but due to the variability of the levels of these substances they were unable to monitor in individual patients the progression of the disease. “You can’t at the moment take a single patient and be sure that you are going to see enough change over time,” explains neurologist Martin Turner, MA, PhD, MRCP, co-director of the Oxford Motor Neuron Disease Care and Research Centre in England. Now, Turner’s team is developing tests based on multiple MRI-based screening tools to more reliably diagnose and monitor the progression of people with the disease. Last November, his team demonstrated that using both structural and functional connectivity MRI-based brain measures they could distinguish, in a study of 48 participants, people with ALS from healthy people with more than 90% accuracy. Called BioMOx, the Oxford study remains ongoing. In future, in collaboration with the University of Miami team, Oxford researchers are going to use some of these same MRI-based tests in hopes to identify changes in individuals at high risk that could be used to determine whether or not they develop the disease and monitor their progression.